When you’re out of town for an important meeting, the last thing you want is to arrive stressed out and tired. To maximize your success as a road warrior, use these five tips to minimize stress while traveling for business. If you plan on traveling by airplane, Forbes recommended cutting down on stress at the airport by signing up for pre-check security clearance. You’ll save time in the security line and you won’t have to remove your belt, shoes, jacket or bag of liquids. Additionally, you won’t need to remove your laptop from your bag, so you can reduce the risk of dropping or damaging it while in transit. Even the simplest business trip can become stressful if your luggage is lost in transit. Minimize the potential for disaster by packing light and fitting everything into a carry-on. This way, you’ll have less to lug around and keep track of while you’re on the road. To save a lot of space, choose clothes in similar colors so you only have to pack one matching business jacket and pair of shoes. Manage your boarding passes and other travel documents using a smartphone app to avoid the stress of misplacing important information. Nowadays, most airlines and even some hotels give you the option of checking in from your phone or laptop, helping you avoid having to wait in long lines. With a swipe of your finger, you’ll be able to look up the time of your flight, find confirmation details for your hotel and even book your car service rides from your house or office to the airport, from the airport to your hotel and back again. Make sure to download GroundLink’s convenient car service app so you can book your ride right from your phone. 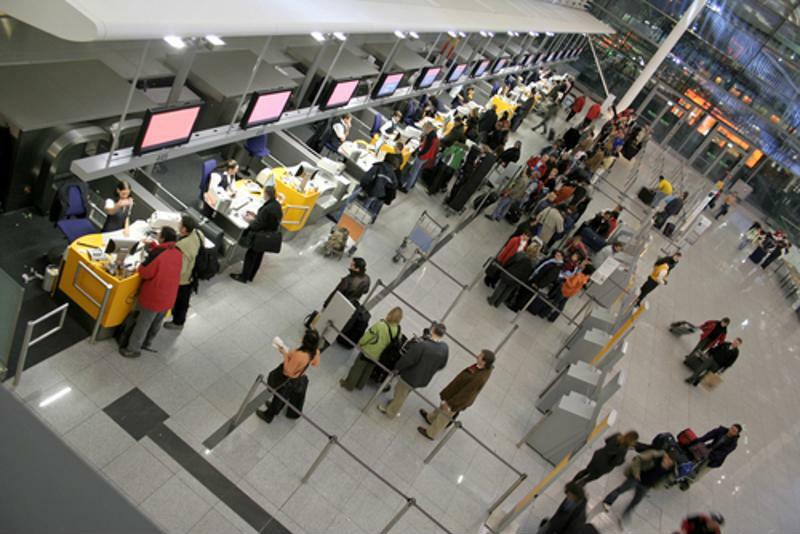 Check-in for your flight before you arrive at the airport to avoid lines. To keep your stress levels in check, make sure that you’re staying hydrated while traveling. Staying hydrated will also help to minimize any symptoms of jet lag you may experience while on your business trip. While most people recognize that exercise is a good way to relieve stress, many skip working out while traveling. If you’re staying at a hotel with a fitness center, wake up early enough in the morning to fit in some exercise before your meeting. You’ll find that you’re more awake and less stressed for the rest of the day. If you don’t have access to a gym, a walk around the neighborhood or even across the airport terminal will help reduce stress while you’re on the road.